You should be able to sit comfortably on your bike and be able to reach the handlebars without leaning too for forward and your fingers should easily cover and work the brakes. It is very important that your fingers can ‘cover’ the brake levers and you should ride with your fingers covering the levers at all times in case you need to stop suddenly. Whenever you decide to stop, make sure you look back first to make sure it is safe to do so. Pick somewhere out of the way of traffic or pedestrians if you can. If you need to, make a signal to let traffic know what you intend to do. Use both brakes to stop. You should apply your back brake before your front brake. Use your back brake to slow you down and gently apply the front brake to bring you to a stop to ensure you aren’t thrown over the handlebars. If your bike was bought in Jersey or the United Kingdom, your back brake is on your left and the front brake on the right. However, if your bike was bought on the continent, your brakes will almost certainly work the other way around. Sometimes it is necessary to apply your front brake only when you are showing a left hand signal. This can be quite tricky and so you should practise ‘feathering’ the brake to control the speed of your bike while signalling. Feathering is just gently applying one of the brakes to control your speed. You should practise emergency stops away from traffic and people. Apply your back brake first. Take care not to apply so much pressure on either brake to skid or lose control. Well before you need to overtake, look all around ahead and behind to make sure it’s safe to overtake. If clear, gradually move out into the primary position so you can be easily seen. Do this early enough you shouldn’t need to signal. Decide whether it is safe to overtake. If it’s clear ahead, gradually pull out to overtake. Signal if there is traffic around and you need to let them know what you are doing. If there is no traffic, there is no need to signal. If you can, keep to the left of the white centre line, do so. This can be difficult on many of our smaller roads in Jersey where they are quite narrow. When it is like this, you must make absolutely sure there is a big enough gap to get passed the car. If it isn’t safe to overtake, you will need to stop behind the car. Make sure you are far enough out and far enough back from the parked car so drivers can see you and you can see them.Remember, if it’s dangerous to overtake, there is no shame in stopping and getting off your bike and pushing to somewhere safer. Overtake leaving plenty of room between you and the parked car. Once past the car, check over your left shoulder to make sure it’s safe before moving back to the secondary position. If someone is sitting in the car on the driver’s side, they may not see you and open the door in front of you. If the engine starts or is already running, the may pull out in front of you or reverse into you. Unseen children or animals may run out in front of the parked car. If there are more parked cars ahead of you and there is a short gap in between them, it is normally safer to stay out in the road where you can be seen and it is easier for you to see what is going on. However, if there is a car coming toward you and it is not safe to stay out in the road, you must pull in as the car coming toward you will have the ‘right of way’. You may find yourself queuing in traffic waiting for traffic lights for instance. It is very tempting to overtake and go to the front of the queue. As a new rider in Jersey, NEVER be tempted to do this, it can be VERY dangerous, especially on our busy narrow roads in Jersey. In the United Kingdom and in Europe, because many of their roads are much wider than ours, special cycle lanes and ‘advanced stop lines’ are sometimes available to help you get passed stationary or slow moving traffic. NEVER EVER try to overtake any queuing or slow moving traffic on the side next to the pavement. People have been killed or seriously hurt doing this. 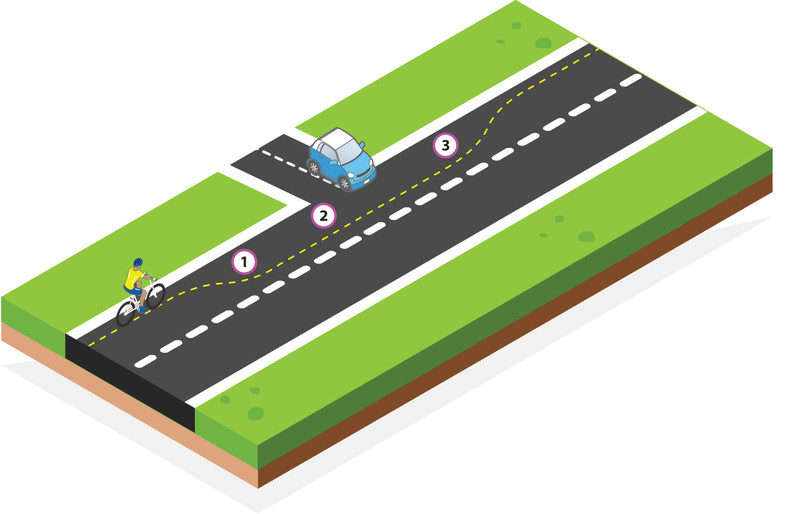 NEVER overtake at a junction (where two roads come together), drivers will often turn in front of you without warning or indicating, or they may possibly let waiting traffic at side roads out as you try to overtake. It is much safer to check around and when safe get off your bike and push it to the next road. If you are queuing behind a lorry or van, where the driver cannot see behind them, because they have no windows to see through at the back of their lorry or van, then make sure you stop well back and that you are positioned so you can see the drivers ‘wing mirror’. If you can see the drivers wing mirror, the driver will be able to see you. When approaching a side road, cars often overshoot the stop or give way lines. Unfortunately, traffic coming out of side roads do sometimes hit cyclists because they find it difficult to see them. 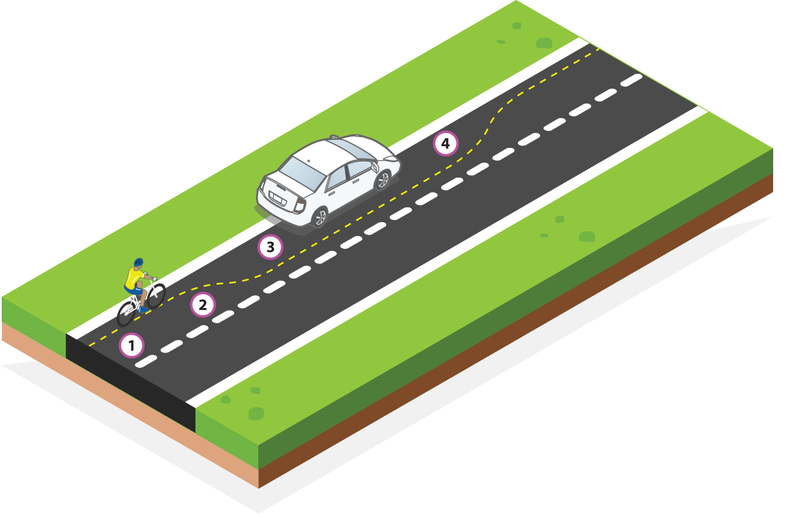 It is therefore very important to move away from the secondary riding position and move to the primary riding position so it is easier for them to see you and leaves a bigger gap between you and the driver at the junction. You need to do it early, never leave it until the last moment. Look back and make sure it’s safe to move into the primary position. If safe to do so, gradually move to the primary position. As you pass the side road keep a good eye out for traffic turning right into the side road (you have the right of way, ride confidently, just be careful) and traffic coming out of the side road. Get eye contact if you can. Once you are past the side road, look back over bother shoulders and gradually return to the secondary riding position.